It seems that the candidates are beginning to solidify their statements and finding ways to distinguish themselves from the others, which was helped greatly by several candidates answering the same question. Due to the time constraints imposed by the forums (30-90 seconds to state an opinion on a complex issue can only result in over-simplification), much of what’s being said is still vague, caters to the middle, and consists mostly empty slogans (e.g., include stakeholders, city is at a crossroads, need to be a community we all love), but thankfully specifics and concrete examples are beginning to be expressed (e.g., if we’re at a crossroads, what are the choices? who are the stakeholders? what makes Rockville unlovable?). A few haven’t felt confident enough to show themselves, and instead their remarks seemed to ape Ronald Reagan (“there you go again”–really? is this the best you can do? ), Jesse Jackson (“we don’t need smart growth, we need to grow smarter”–huh? ), and even George Patton (please stop the stories of life on the battlefront). At least we didn’t get any quotations from Washington, Lincoln, or Edison. Although most of the candidates demurred on their choice for mayor, a couple did not and small coalitions are now apparent: Marcuccio, Newton, and Trahan vs. Gajewski and Pierzchala. There are also some strong differing opinions about the state of the city’s finances. Les Francis claimed the city is approaching bankruptcy and favors significant staffing cuts, Richard Gottfried said we have a multi-million dollar surplus, and Phyllis Marcuccio took a third stance by stating, “we’re in financial management trouble, not financial trouble.” I assume someone will pull out the city budget with its projections and determine who got their facts wrong. The APFO received continuing attention with most stating they support control over development (with plenty of references to Town Square, Choice Hotels, Rockville Pike, and Walmart) but opinions varied widely over whether the current ordinance helps or hinders and how it might be revised. But discouragingly, a few didn’t seem to really understand it or the zoning code (oh my! by now, they should have these mastered). Regarding relationships with other government agencies, most agreed that things have improved overall but schools (MCPS and Montgomery College) were worst, county and feds in the middle, and it’s best with the state. Max, your summary of the questions that were asked is good. 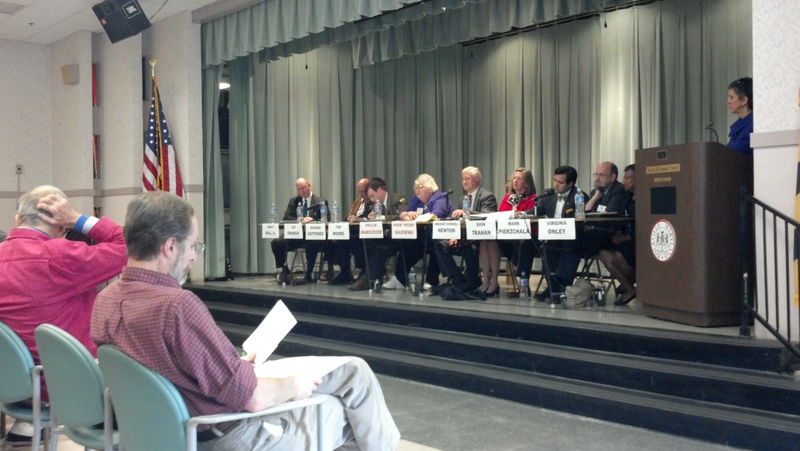 The format was an improvement over the first candidates’ forum on October 13. Today I was pleased to see candidates endorsing each other because this shows us who wants to work together. Endorsements were lacking in previous campaigns. In 2009 I wanted candidate Waleed Ovase to endorse candidate Phyllis Marcuccio and Phyllis to endorse Waleed. None of the candidates that year wanted to make endorsements. I supported both of them. Hurray for the change in this campaign. What is most important to me is how the council represents me and my community. Staff is responsible for providing the entire council all the information needed for them to make the best decisions representing the entire City. With good information and citizens’ inputs, a good city council team will make the best decisions. Mayor Marcuccio has tried her hardest to represent the citizens of Rockville. I do not agree with all her positions, but she listens and has the best interest in mind for Rockville. Also with a good team,I believe Mayor Marcuccio can be an even better Mayor next term. I am willing to give Mayor Marccucio another opportunity to serve Rockville as Mayor. Let Mr. Gajewski continue as Music Director & Conductor with the National Philharmonic. I believe that voting Dion Trahan on Phyllis’s team will benefit Rockville. He is passionate, has fresh ideas, a law degree from another state (Louisiana – his accent gives that away), would bring diversity to the council, and is serving on the Rockville Planning Commission. I am willing to vote for Dion Trahan as my ROCK. Max, I was also in attendance at this candidate’s forum today and I counted exactly 100 people with 5 girl scouts and 2 leaders arriving at 2 p.m. My count includes everyone in the room as well as the candidates. I read with interest the continuing, uninformed statements of Les francis about Rockville’s finances. It is a shame that a seemingly intelligent man has not bothered to research what the reality of the finances and budget really are. The City has never had a general fund budget deficit either at the beginning of the year or at the end. We have a 15% operating budget reserve, down a bit due to spending decisions of the M & C the past two years. We are the only City of our size in the US with a AAA bond rating. We just had a citizen task force under Mark Pierzchala’s leadership review and under score all of these facts. The future Challenge is to broaden our tax base to support the comminity’s needs going forward. One way to do that would be for the City to gain all or part of the already collected sales taxes in Rockville which now go to the State. Another would be for the City to have the County and State provide revenues in lieu of taxes for the 10% of institutional uses of land in Rockville. Bridget Broullire, station manager of Rockville Channel 11, confirmed that the candidate forums will be live on the channel and online this Tuesday and Thursday starting at 7pm. Then they will rotate the replay of all three of the forums leading up to the election. The link to the replay schedule is posted on the left hand bar of the Rockville 11 page.